Old School Radio One DJs. Dontcha just love ‘em? Well, no, not really. With the honourable exception of Johnny Walker (and we might consider a conditional discharge for Alan Freeman), they were all guilty of horrendous crimes against music. And that includes John Peel in his pre-punk Floyd-worshipping days: he may have genuinely cared about the music he played – as opposed to simply following orders like the rest of them – but he really did have appalling taste. Anyway, never mind Peel, a more typical member of the squad of charmless young men who operated the nation’s turntables was Ed ‘Stewpot’ Stewart, who presented Junior Choice (which basically involved him playing Jackie Lee’s ‘Rupert the Bear’ as often as possible to children too small to reach the off switch), and who also played in goal for the Radio One football team. Here he is in 1973, with a book that resembles nothing so much as one of those pop annuals from the period, though without the pictures. There are chapters on groups as diverse as the Osmonds and the Rolling Stones, on artists from Olivia Newton-John to David Bowie, all delivered in that bland, uncritical tone that invites you to share the writer’s joy at the sheer wonder of the world of pop. The term ‘dumbing-down’ was still twenty-five years away, but that’s what you get here and what you got on Radio One: an all-encompassing embrace of the industry that could only be achieved by suspended all questions of taste and judgement. This was pure lowest common denominator stuff. And in between the guff about pop stars is a chapter on the DJs themselves, where Mr Stewpot eulogizes the likes of ‘the very likeable and popular Tony Blackburn’, ‘my old mate Tony Brandon’ and ‘that looney-humorist Noel Edmonds’ and explains that it’s ‘a privilege to be in such marvellous company’. Indeed. Of far, far greater interest is Emperor Rosko’s book. 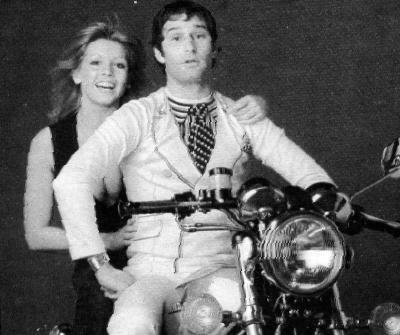 For those who might have forgotten the man who billed himself as the Royal Ruler of the Airwaves, Rosko was born Michael Pasternak (his dad, Joe Pasternak, produced Hollywood movies like Destry Rides Again and Anchors Aweigh) and became a DJ on Radios Caroline and Luxembourg before moving to Radio One. And he was another partial exception to the rule that all Radio One jocks were awful: the US-derived style was somewhat laboured and the relentless self-promotion irritated, but he did have decent musical taste, and we kinda liked him in spite of himself. Apart from being amused by his curious habit of referring to himself in the third person, I’m not convinced by his chronology: the Paris uprising was in May 1968, ‘Street Fighting Man’ was released on the Beggar’s Banquet album in November 1968. Unless I’m very much mistaken, I don’t reckon Rosko would have had the chance to play the record on Luxembourg, even had he wanted to. Nitpicking aside (I do like to pick the odd nit), this is a fine snapshot of life as a radio DJ in the mid-70s. It’s actually co-credited on the title-page to Rosko and Johnny Beerling – a respected producer on the station (albeit the creator of the simply awful Radio One Roadshow) – and one can only assume that Mr Beerling was responsible for the discipline of the writing and the sheer barrage of information contained here. Worth looking out, if you’re interested in broadcasting history.